In this article, Ross Hauser, MD discusses Prolotherapy as a non-surgical treatment of lumbar radiculopathy. The best conventional medicine has to offer for lumbar disc herniation and associated lumbar radiculopathy are surgeries that do not work that well. In other words, the best conventional medicine has to offer for lumbar disc herniation and associated lumbar radiculopathy are surgeries that do not work that well. Please see my article: Non-surgical treatment of a herniated disc. Unfortunately, treatments with less than great results in the medical literature are given until “all has failed,” and the patient is sent to surgery. Please see this supporting article on our website: failed back surgery risk factors. In our experience, many individuals who are diagnosed with lumbar radiculopathy, are more likely to have a “pseudo” radiculopathy. This is a condition where radicular pain comes and goes with changes in activity or changes in position, pinching the nerve intermittently. If this is the case, then we can look for an underlying spinal instability caused by ligament injury to the lumbar spine which is often overlooked in pre-surgical consults. If ligament injury is there, we can offer the patient Prolotherapy as a non-surgical means to repair the damage, strengthen the spine, alleviate the pain and symptoms of lumbar radiculopathy. A lumbar disc herniation is a condition frequently encountered in primary care medicine. It may lead to a “compressed nerve,” leading to a nerve root irritation,“a so-called radiculopathy”, with or without a sensorimotor deficit (varying levels of loss of sensory or motor skills). The majority of lumbar disc herniations can be conservatively treated with physical therapy, analgesics (pain killers), anti-inflammatory therapy or corticosteroids, which may be eventually administered by infiltrations (various injection or infusion techniques). What is described above is the typical road to surgery. This was a warning issued by doctors writing in the medical journal Clinical spine surgery. Here the doctors noted that the success rates of surgical interventions for lumbar disorders vary significantly depending on multiple factors and, among them, the duration of symptoms. What these doctors from Boulder Neurosurgical Associates were looking for was to see if there was a “cutoff” time when lumbar decompression and fusion surgery becomes less effective in the conditions with chronic nerve root compression symptomatology. Thus they analyze whether duration of symptoms has any effect on clinical outcomes and primarily resolution of radicular pain symptoms due to degenerative disk disease and stenosis with spondylolisthesis in patients undergoing transforaminal lumbar interbody fusion (TLIF). The results they achieved showed that the duration of symptoms was a significant predictor of better leg pain resolution, but not back pain resolution, or improvement in disability. The duration of the patient’s symptoms was found to be negatively significantly related to lesser pain improvement. For each week of the duration of symptoms, the percentage of improvement decreased. Back to the Penn State research, the doctors also found that patients with pain with lumbar extension (most commonly a popular exercise where patients “stretch” their spine by bending backwards) was negatively and significantly related to length of relief duration from the caudal epidural steroid injections. It is interesting that patients who failed to have their symptoms managed with epidural injections are treated with epidural injections before and after failed surgery for radiculopathy, only with stronger and more frequent doses. Epidural steroid injections ease pain temporarily by reducing the size of stressed nerve roots. However concerns over short-term gain long-term costs in the use of epidural steroid injection side-effects have been noted. Epidurals are part of the common treatments for light cases of lumbar radiculopathy which usually include NSAIDs (non-steroidal anti-inflammatory drugs), physical therapy, or chiropractic treatment. Although many patients respond very well to these treatments, they are only temporary fixes that can help ease the pain and only relieve some symptoms of the condition. Many patients will be sent off for physical therapy. These patients often see mixed results. In utilizing Prolotherapy as a treatment, diagnosing lumbar radiculopathy as a transient pain, as mentioned above, requires a physical examination, manipulation, and palpitation of the suspect area. Most often individuals, as we discussed, who are diagnosed with lumbar radiculopathy, really have more of a radicular pain that comes and goes with changes in activity or changes in position. This means the nerve gets pinched intermittently possibly caused by an underlying ligament injury to the lumbar spine. The ligaments become weaker and allow for more movement than normal. The vertebrae then move excessively, and the nerve can get pinched. This pinching causes extreme pain down the legs and feet. If the lumbar radiculopathy is intermittent, then the leg pain will be occasional or intermittent. 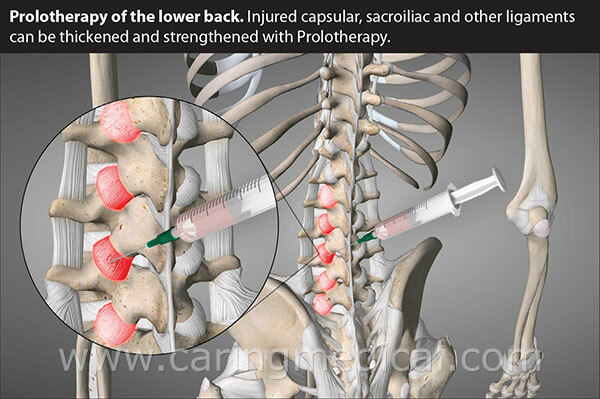 Prolotherapy to the injured and weakened areas will stabilize the lumbar vertebrae. Intermittent radiculopathy generally responds very well to Prolotherapy. How does Prolotherapy help radiculopathy? Radiculopathy by definition means a nerve is being compromised leading to symptoms in the extremity. We find that 90% of people coming in with the diagnosis of radiculopathy do not have a pinched nerve. In the case of a true pinched nerve, most Prolotherapists will get the person some pain control while the Prolotherapy is working. The person with a true radiculopathy needs to decrease the inflammation of the disc material pressing on the nerve while the Prolotherapy helps stabilize the herniated areas. The best approach, in our opinion, is to give a steroid injections right around where the disc herniation is located. This is called a nerve block. Simultaneously Prolotherapy works on the long-term cure. Yes the steroids block some of the Prolotherapy effect, but the person needs immediate pain relief. Up to four Prolotherapy sessions are sometimes needed. The above approach has been used at Caring Medical Rehabilitation Services for years. It has kept a lot of people out of surgery. In our experience the above approach even with herniated discs is around 90% successful. Of course, we have our handful of cases that have needed surgical consultation and surgery. We are grateful the surgeons are there for back-up. Even for an acute herniated disc the surgeon is second line therapy, or the person with a pseudo- or true radiculopathy the treatment of choice is Prolotherapy. In Caring Medical and Rehabilitation Services published research in the Journal of Prolotherapy we cited our own data and that of others in demonstrating the effectiveness of Prolotherapy for back pain. In our research we reported on 145 patients who experienced low back pain an average of 58 months, who were treated on average with four sessions of dextrose (12.5%) Prolotherapy, quarterly, at a charity clinic. 8. Hauser RA, Hauser MA. Dextrose Prolotherapy for unresolved low back pain: a retrospective case series study. Journal of Prolotherapy. 2009;1:145-155.